When it comes to grilling, there is little worse than being under the beating sun while stooping over a hot grill sweating though your new polo. Thankfully though you can purchase a grill gazebo to provide a blessed oasis of shade from the scorching rays. Not to mention they are easily set up, provide excellent UV protection and have some really slick extra features to make your next grilling session a blast. We’ve put together the table below which details our top three picks for quick reference. 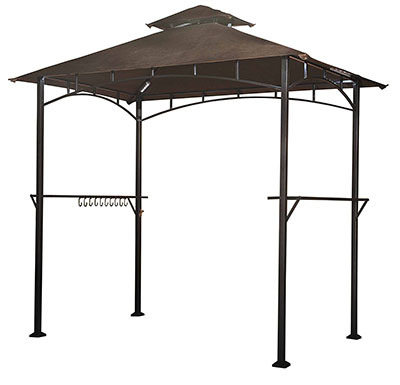 With a roomy 8’ x 5’ soft canopy, unique two-tiered vented roof design and extremely sturdy construction, this is by far the best grill gazebo on the market. The Sunjoy L-GG001PST-F is an incredible blend of functionality, design and engineering. One of the features we were most impressed with were the convenient storage shelves and tool hooks. They were the perfect height to place all our sauces and plates while having our tongs and grilling tools ready and waiting. We also loved the LED lights that came with the grill gazebo, they made grilling in the later hours of the evening a blast and provided a great ambiance and added wow factor. Is the canopy water proof? Yes. Can it be installed on grass? Yes, the unit comes with 8 metal stakes. How high are the shelves? The shelves are 4’ off the ground. I’m tall, will I fit under the canopy? If you’re under 6’4” you’ll have no issue walking in and out of the canopy. How big are the leg poles? The leg poles are 3” x 3”. Can I leave it out all year long? Yes, the Sunjoy Grill Gazebo is built for all season use. How long does it take to assemble? Around 30 minutes with a screwdriver. If you’re looking for a more budget friendly grill gazebo that still has the same high quality feel the Palm Springs Deluxe would be an excellent choice. With an 8’ x 4’ footprint it is just a bit smaller than the Sunjoy, making it an ideal choice for more compact spaces. 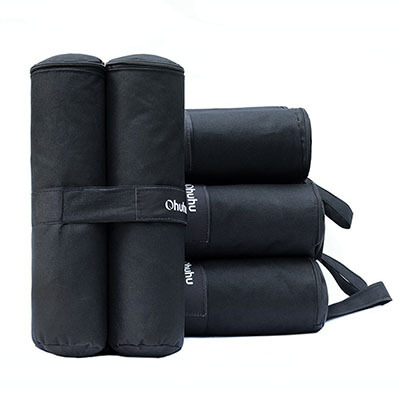 It also retains the great two-tiered soft canopy design which allow for incredible ventilation and added stability during high winds. 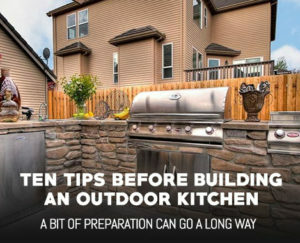 If you do planning on using this grill gazebo in more than a light breeze you’ll want to use the eight included stakes to secure it to the ground prior to firing up the grill. We thought the meshed shelving was a great idea to stop pooling water and make cleanup a snap, but we did find ourselves missing the hooks that are available on other models. Can the canopy be removed for storage? Yes, the soft canopy can be easily removed. Can the grill gazebo be screwed to a deck? Yes, using 2 screws per leg. Can this grill gazebo be used with a charcoal grill? Yes, it is safe for all grills. Can it be left up in the winter? Yes, the Palm Springs Deluxe is can be left out in most conditions. Does the grill gazebo come with stakes / pegs? Yes, it ships with 8 pegs to secure it to grass. 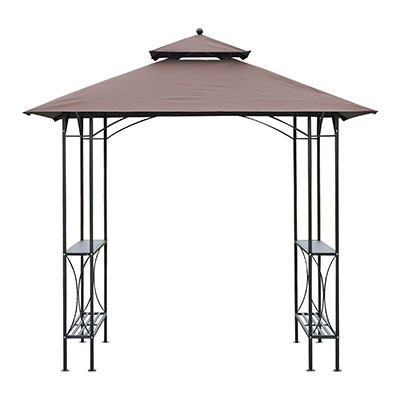 When it comes to pure stylistic points, the Outsunny Outdoor BBQ Grill Gazebo is the clear winner. With graceful arching steel supports, and minimalistic horizontal supported design and a natural tan color scheme really help to draw attention to it, and the grill your manning underneath. It’s unique quad shelf design is also great for storage and offers double the storage of the other grill gazebos we reviewed. While it is lacking features like the meshed shelves and the LED lights, it is everything you need in a single package. 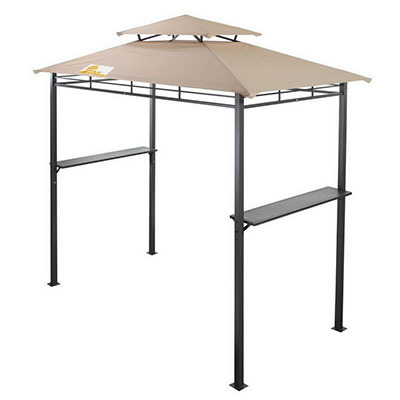 The high quality steel supports and low maintenance polyester canopy will provide you years of shade and create your very own grilling heaven. How sturdy are the two shelves? Quite sturdy even under heavy loads. Is the canopy UV resistant? Yes, the canopy is UV resistant and offers protection from the sun. What is the maximum height of the canopy? The Eave height is 6’-2”. All of the grill gazebo options that we reviewed make for incredibly useful additions to any outdoor patio or backyard. However, we still have to recommend the Sunjoy L-GG001PST for its high-quality construction, awesome LED light features, stellar storage and super handy hanging hooks. Include that on top of easy assembly and storage and you have a total winner in our book. 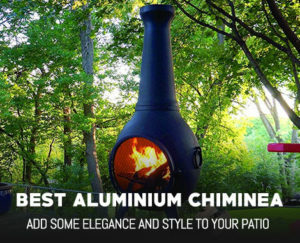 If you pair this with a great fire pit off to the side, you’ll have the entire neighborhood envious our your outdoor man cave.